One of my best friend’s daughters is turning four! So many soon-to-be four year olds love Disney Princesses. 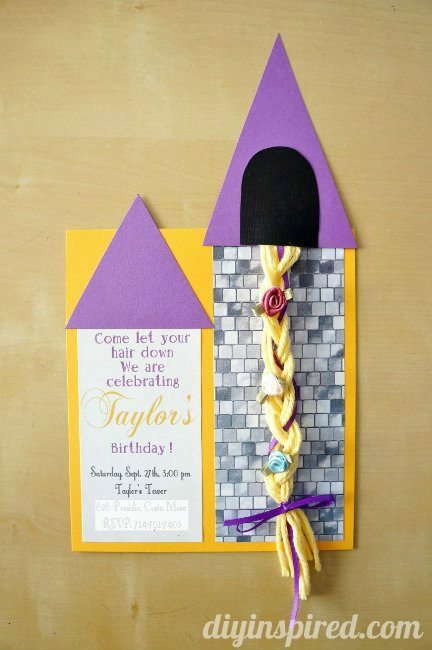 Recently I made a Little Mermaid clam shell birthday card for our other bestie and this time, I volunteered to make a Rapunzel invitation for a Tangled themed party. I perused Pinterest for some ideas and inspiration and I found some great ones, but ended up making a version of my own. Here is how I made them. Prepare your pieces as shown. These are the measurements amounts per one Rapunzel invitation. Keep in mind that my friends did not need envelopes because she was hand delivering each invite, so measurements will differ in order to fit inside envelopes. 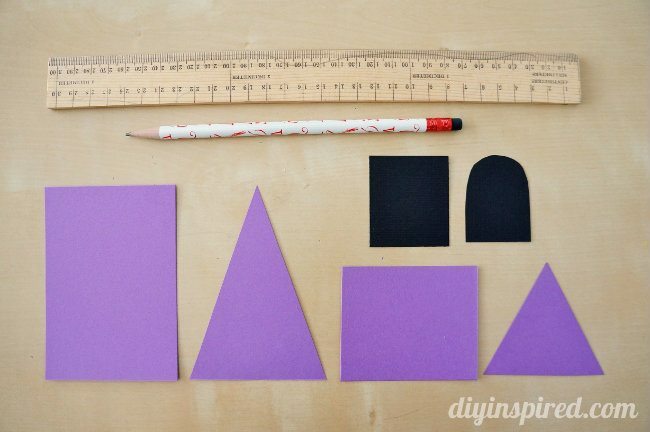 Next, cut the purple rectangles into triangles, and the black rectangles into windows, using a pencil and ruler to measure. 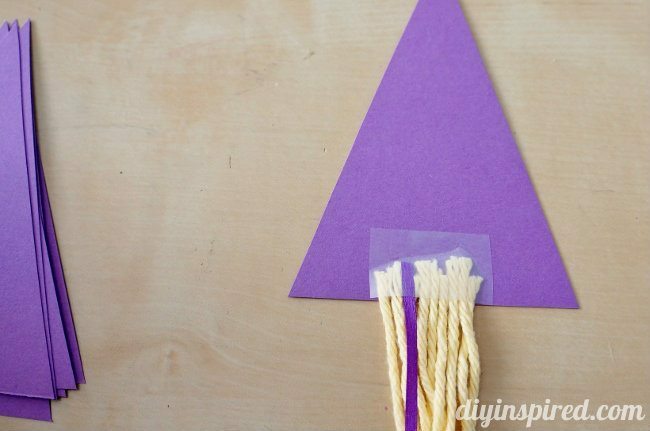 I assembled the invitation as shown with a glue stick, using the small purple triangle. Next, I bunched 9 pieces of yarn and 1 purple ribbon and taped it to the larger triangle. I braided the hair and then hot glued the black window on top. 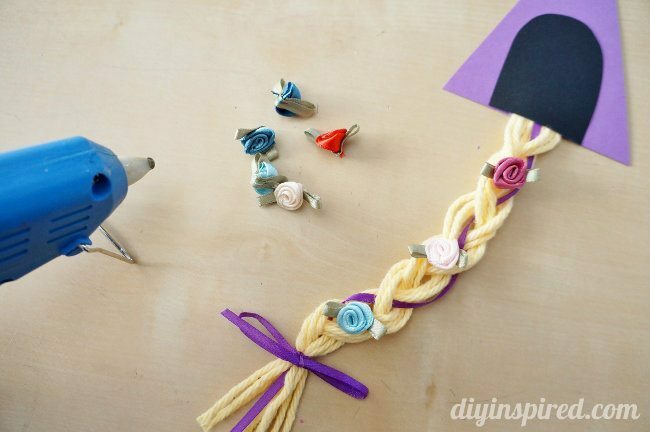 I hot glued three ribbon craft flowers onto the hair. Lastly, I hot glued the hair falling out of the window onto the invitation. Here it is! 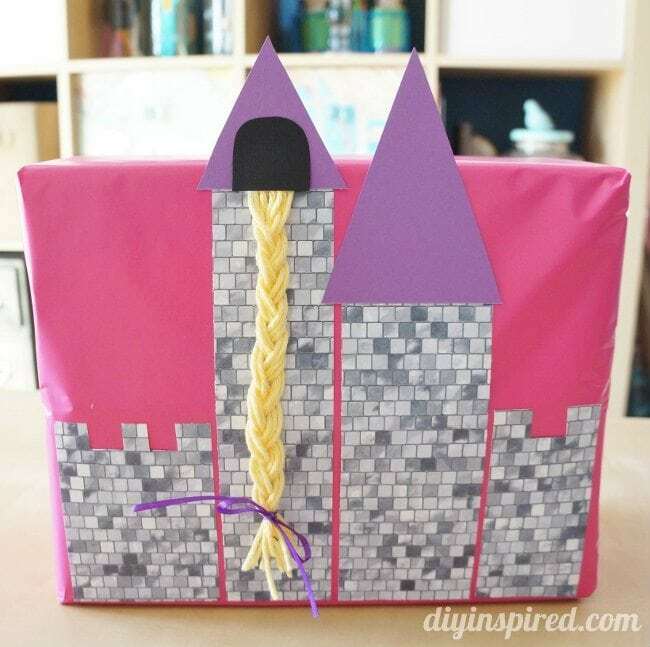 I also made a little castle out of left overs to make some unique gift wrapping for her gift. We can’t wait to give it to her! Hi, I love the invitation! Where did you find the stone printed scrapbook paper? Hi Sheri! I bought individual sheets at Michael’s Craft Stores. Thank you! 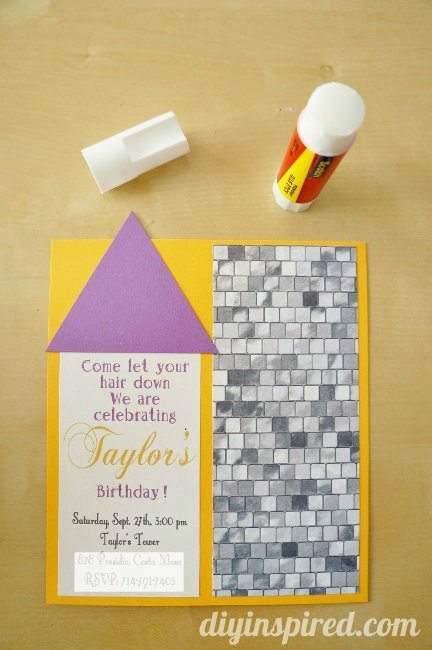 Very cute invitations! Thanks for sharing! These will be perfect for my little girl’s 4th Birthday party! 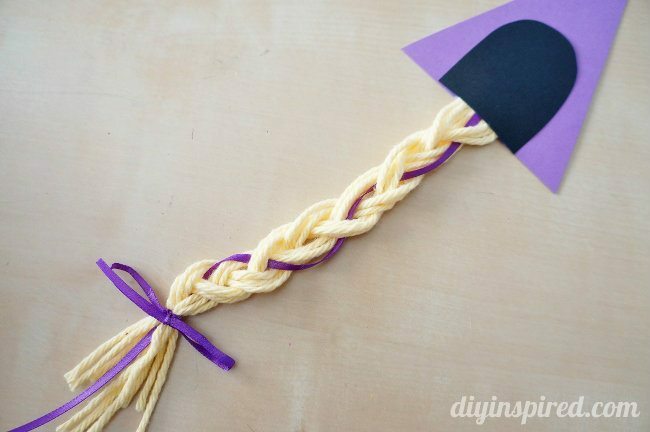 How many invitations did you make and how many of pieces of each color paper did you need? Thank you, Rebecca! I think I made 15 invitation, but I don’t remember how many of each piece I bought! So sorry! Hi! This invitation is beautiful. 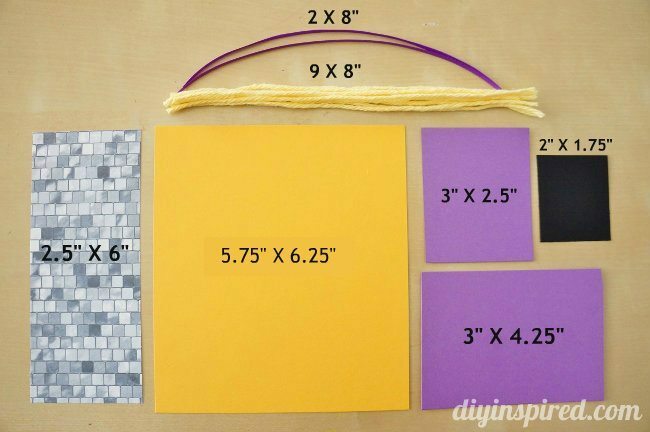 I’m making it now for a friend’s daughter’s 4th birthday and just wanted to make you aware that the measurement you have listed for the yellow paper is off!! It looks to be more like 5.75″x6.25″ maybe. I stared to cut my yellow paper first and immediately realized the measurement you have listed is way too small. Hope this helps someone else who might make these cute invites! Thank you, Jessica for catching that! I’m so glad you like them. I hope the measurement mistake didn’t cause you too much trouble! You are right, Salyn! I will change that. It should be about 5.75″X 6.25″. So sorry about that! 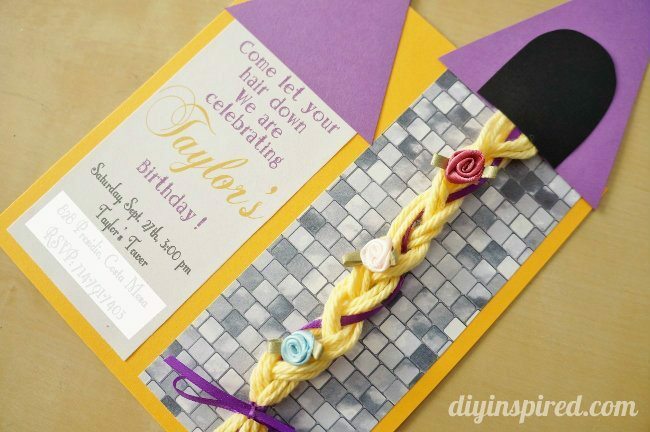 What did you use for n envelope for these cute invitations. I did a practice run on the card and it turned out great! Oh great!! I made them for my best friend’s daughter and she handed them out at school so she didn’t need envelopes. But if I recall, I think they would fit in these, but maybe measure the one you made just to be safe! http://amzn.to/2jQA08A (affiliate) I hope this helps, Sue! So glad you like them!